A simple flan-like cake that needs no embellishment, aside from a sprinkle of powdered sugar, filled with fresh sweet cherries. Light enough to eat as breakfast or a midnight snack without shaming yourself (much). 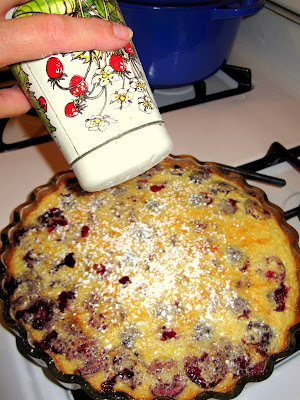 There's nothing difficult about Clafouti ("cla-foo-tee") other than that frenchy name, but I've simplified the recipe a bit anyway, from the Julia Child version in her famous tome of French cookery. 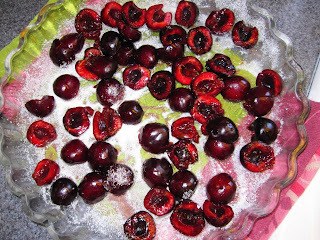 Delicious and easy and you can substitute any sweet fruit with the same great results. Because this recipe uses a double dose of almond flavoring we're going to start a little almond milk on the stove first off. 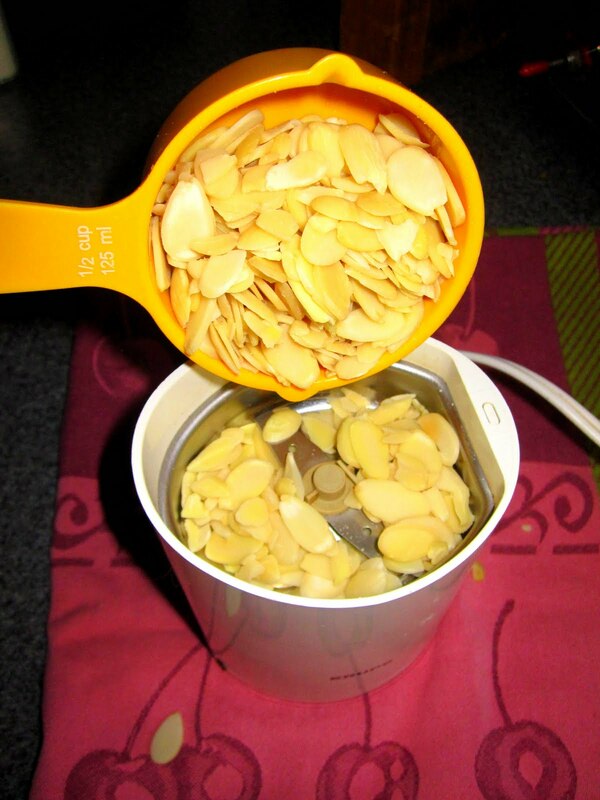 You can use whole almonds or if sliced is all you've got, like me, then that will do. I use this small coffee grinder only for spices and small jobs like grinding these almonds, but you could use the food processor if yours isn't a big hassle to drag out of the appliance garage like mine is. Grind 1/2 cup of almonds, I did this in two batches, pulsing just a few times quickly to get a rough meal. 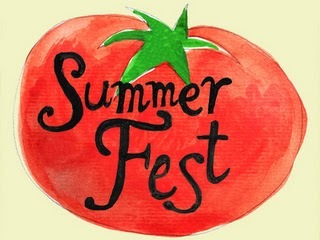 Watch it or you'll end up with almond butter! 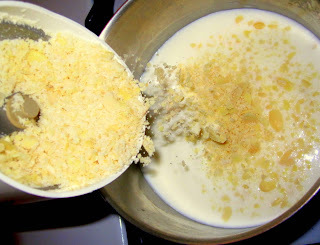 Add these to 1-1/4 cups whole milk in a small saucepan and bring it to a simmer, not a rolling boil. Now just turn off the heat and let it sit. Also, preheat the oven to 375 now. Wow, that sink sort of looks like a crime scene? 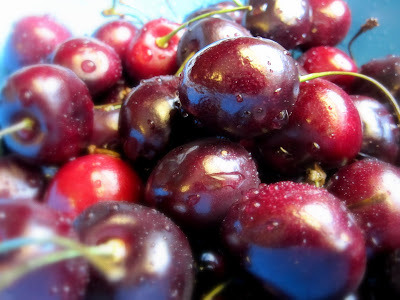 Since we're working with fresh cherries it's time to pit and halve them. I have a pitter from the days of 6 thriving cherry trees in our orchard, but if you aren't in possession of such a contraption, just halve the cherries and flip out the pit with the point of the knife. 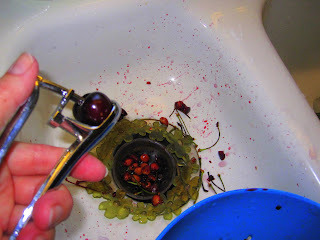 Better not do this in your favorite white summer sundress because cherry juice is a stubborn stain. And what are you doing in the kitchen in a sundress anyway? When you have at least 2 cups of cherries, 3 if you're lucky, turn them into a 10" dish that has been Pam-sprayed and sprinkled with 1 Tbs of Sugar. 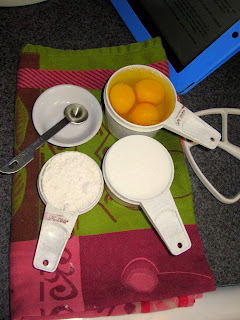 For the batter, you can use a blender or electric mixer. Beat 3 eggs, 1/2 tsp almond extract, pinch of salt, and 1/2 cup sugar until well blended. Finally, add the almond milk alternating with 1/4 cup flour. No need to strain out the almonds as some recipes recommend. 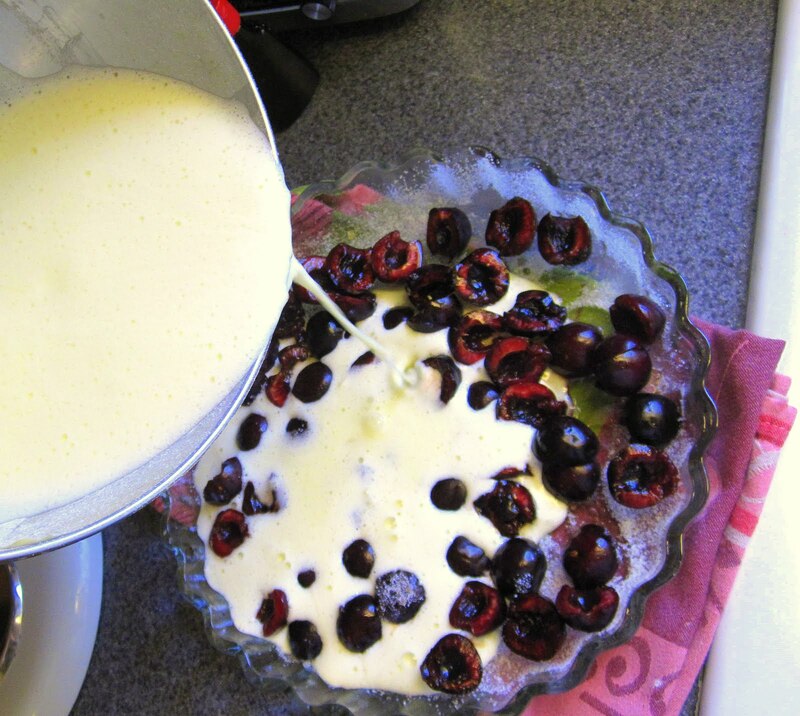 They come to the top as the clafouti bakes and add a nice little crunch. Bake about 30 minutes or until knife in center comes out clean. Dust lightly with powdered sugar and serve warm or cold. Day or night. Alone or to cheers.